Great author visits start with preparation! Students who have read the author's work ahead of time connect to the presentation in a more meaningful way! I'm happy to consider school visits or other speaking engagements at libraries or conferences. Please e-mail me at melissawyattauthor@gmail.com. 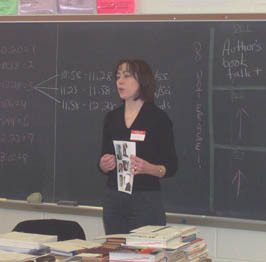 I offer various presentations suitable for grades 6 through 12, covering what it takes to be a writer, the writing process, the publication process, revision, etc. I can also lead students through a series of short, painless (I promise!) writing exercises. We can cover story starters, creating and developing characters, writing dynamite opening paragraphs, etc. Daily fees for schools are $600. Presentations can be tailored to meet scheduling needs or elements from various programs can be combined. I will speak to as many as three large groups in one day or four smaller, classroom-based groups or a combination of the two. Library and conferences fees vary. Please contact for more information. I can easily travel to schools or libraries in the south-eastern Pennsylvania and northern Maryland areas. Engagements outside these areas may require travel expenses such as train or airfare and hotel accommodations.